Servicing an Italix Parson's Essential or Churchman's Prescriptor. 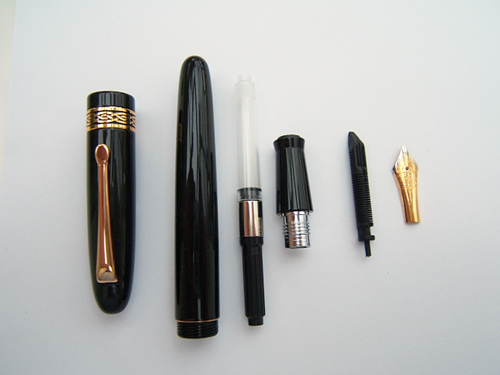 Pens that are used everyday with a quality fountain pen ink rarely need servicing or cleaning. However if your pen is not used regularly, ink will dry on the feed and your pen may need cleaning and adjustment. With most quality pens this is not a job for the enthusiast but Italix uniquely simple construction makes them ideal for the servicing at home. From left to right in our image. Cap - Barrel - Converter - Nib Unit - Feed and Nib. Nib Unit holds the nib and the ink feed. The nib and feed fit into the nib unit and are compression fit. Never use tools, there is no need for tools and they will mark or distort the components. Use your finger and thumb only. First remove the nib and feed together. 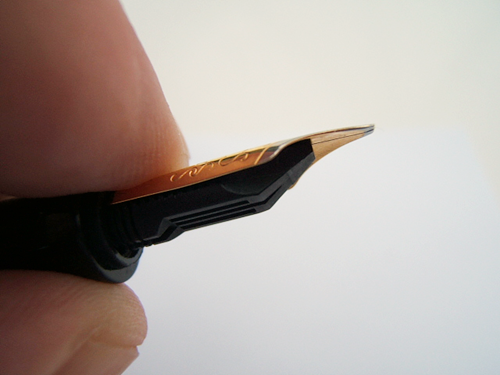 Grip the nib and feed together with your thumb and finger, pull out from the nib unit. If it is stuck with dried ink, give the unit a soak in warm plain tap water. A slight wiggle of the nib and feed will bring it clear. Do not use force. Clean the feed in warm water, use a soft toothbrush if needed. You can also leave it to soak overnight. No need for detergent or cleaning sovents of any kind. Reinsert the feed into the nib unit. The feed has a correct position, this is found by gently turning the feed in the nib unit until it moves down into position. The Captain's Commission, has a guide slot inside the nib unit, make sure that the feed engages with this slot before pushing gently into position. Inserting the nib back into the pen. The nib tip is split into tines, these should be aligned. If not align them gently. The nib slides over the feed into the nib unit. Gently push the nib down until about 3 mms on the nib tip (tines) show above the feed. The nib has a natural position, so do not force it, just push into position gently. On the Churchman's Prescriptor the nib may require turning so that the openings in the feed are equal both sides. The Captain's Commission, has a guide slot inside the nib unit, make sure that the feed engages with this slot before pushing gently into position. If you get stuck, just telephone us on 01895 630361. Pens can still be serviced by us, so if you do not feel confident, just return the pen. The above covers servicing only, repairs are best carried out in the MrPen workshop. In this video we mention the use of an Ammonia solution. It is important to use only household ammonia, dilute in in a mix of 90% water and 10% ammonia with a drip of dishwasher detergent. Warning ammonia vapour can sting the nose and eyes, use with caution. Follow maker's instructions and keep out of the reach of children.